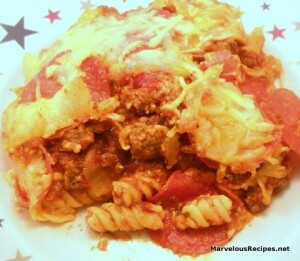 The delicious robust flavor of pepperoni pizza in a convenient taste appealing casserole! I made this for dinner last night and my family loved it!! 1. Cook pasta according to package directions. Meanwhile, in a large skillet, cook the beef and onion over medium heat until the meat is no longer pink; drain and return to the skillet. Stir in the salt, pepper, garlic powder, Italian seasoning and pizza sauce; set aside. 2. In a medium bowl, combine the egg, milk and Parmesan cheese. Drain the pasta; toss with the egg mixture. Transfer pasta mixture to a greased 2-quart casserole. Top with the beef mixture, pepperoni and mozzarella cheese. 3. Bake at 350 degrees F. for 30 minutes or until hot and bubbly and cheese is melted. Makes 6 servings.